FOSTER HOME URGENTLY NEEDED FOR OREO AND HER 6 KITTENS!! Oreo gave birth to 6 babies outside, the morning of April 18th, 2019. Fortunately, they were all captured and taken inside before the rain started. They are safe for the moment but cannot stay where they are as the rescuer has cats of her own and limited space in her home. 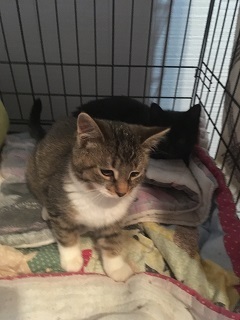 This is a special needs cat who will need a very experienced foster family..
Oreo and her kittens will have to stay where they are for a couple of weeks while they are being assessed. Do you have room in your heart and your home for this family? If you are experienced in raising and caring for newborns and their nursing mom, please fill out a foster parent application. If you are not able to foster at this time but would like to donate to the cats and kittens in our care, all contributions are gratefully accepted. This is the time of year when our resources get stretched quite thin with the high expenses that come with kitten season. We thank you in advance for your support and generosity, we could not do what we do to help these cats and kittens without your assistance. NATASHA IS READY FOR ADOPTION!! Natasha is a DSH brown tabby born March, 2018. Sweet Natasha has a calm energy that she brings with her wherever she goes. She’s always impressively Zen as her rambunctious kittens crawl all over her demanding attention. She likes to follow her foster family from room to room spreading her good vibes as she lays next to them in bed on the couch. Natasha has the softest round eyes that make it almost impossible to deny her anything. Which is ok since she doesn’t asking for much, just a little piece of chicken now and then! If you’re looking for a peaceful companion to share your space, Natasha is the kitty for you! For more information about Natasha, or to arrange a meet and greet, please fill out an adoption application. WHAT A DIFFERENCE A WEEK AND A LOT OF TLC CAN MAKE!! Ariadne and her kittens were in very rough shape when Abbey Cats was asked to take them in. We reached out to the community for an experienced foster family and donations to help with their care.. The response was heartwarming and with your help, mom Ariadne and her kittens are now thriving. We are so happy that we've been able to save this family and we couldn't have done it without your help. It's kitten season and unfortunately, there will be more pregnant moms, moms with kittens and orphans who will need our help. 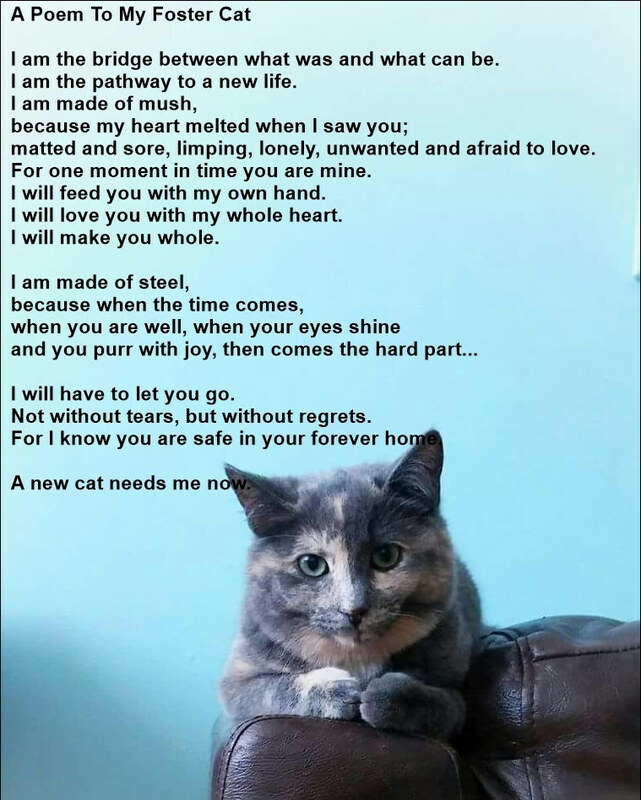 If you can open your home to foster please fill out an. If you are unable to foster at this time but would still like to help, please consider making a donation. THESE SISTERS ARE IN NEED OF A NEW HOME!! Dale and Inga are needing a new home. Their human has been admitted to hospital and the prognosis is not looking good for her. She wants to find her beloved companions a new home that will show them the love they are used to. The girls are two years old, spayed and front paws declawed. If you have room in your heart and your home to welcome these sisters, please fill out an adoption application and one of our volunteers will get back to you with more details. These girls need to find a new home together ASAP!! GABRIEL AND FLOUFFE ARE READY FOR THEIR PERMANENT HOMES!! Gabriel (a Russian Blue cross) and Flouffe (tabby and white) were about to lose their home as their owner had to move and unfortunately was unable to take them with her. She contacted us and we were able to take them in to foster care. The boys are 11 months old, neutered and friendly. Gabriel and Flouffe get along well together and while we are not sure that they're bonded, they both enjoy each other's presence and need another cat for company. While they would like to be adopted together, it is not mandatory that they stay together. If you would like to add either or both to your family, please fill out an adoption application. ROZLYN HAS HAD HER KITTENS!! Meet the newest additions to the Abbey Cat family!! Stay tuned for more pictures and updates..
Haru gave birth to 6 kittens. It's too early to know the sexes yet but she appears to have had 4 dark tabbies and 2 orange tabbies. and please note that we will NOT be taking applications for these kittens until they are posted on our available kitten page. THINKING ABOUT LETTING YOUR CAT OUTSIDE??? SIMON IS LOOKING FOR A NEW HOME!!! Through no fault of his own, Simon is in urgent need of a new foster home, or even better, a forever home! Can someone help him out? Simon is unable to remain with his current foster parent because severe allergies are jeopardizing her health. She would have kept him for the rest of his life otherwise. Please read his story, told by his foster mom. Simon was rescued off the streets after his rescue mom Hailey realized he is not truly a feral cat nor does he belong on the streets of Toronto. As Hailey put it, she looked into his eyes and in that moment she just knew – he was tired, wanted off the streets and needed her help. All we are able to guess about this amazing cat is that he was likely someone’s loyal companion until he was either left behind or got lost. He spent at least a couple of years or more on the streets. During this time, he never got close to other cats in the colony and in fact, throughout his survival months he collected some battle scars and developed an anxiety around other cats. He was what his colony feeders and Hailey called a "fringe" cat. Simon hung on the outskirts and always waited to eat after everyone else had left the feeding area. Once trapped, Simon had a very rough start at first. Unexpectedly, Simon spent a full 8 days stuck in a covered trap with the only human interaction being to feed him and transfer him from one trap to another for cleaning. Without knowing what was happening to him, he understandably was highly stressed, mistrusting and a challenging foster. Simon's challenges while stuck in a trap for 8 days carried into his foster home with issues such as biting, scratching, territorial protection, anxiety related to feeding times & food in general as well as, some stalking behaviour. As a result, Simon swiftly went through 3 foster homes as he became a difficult cat to place and needed a very special type of home and person. Vets and techs who met Simon recommended releasing him back to the outdoors as they deemed him to be too feral but, Hailey knew that was not what Simon needed. What Simon needed and still needs is someone to be patient and give him a chance to build a connection with his person in his own time just as I have being his 4th and longest foster mom. My name is Saodat and I have been fostering Simon since late July 2018. I cannot thank Hailey enough for believing in this cat, for giving him a chance and for not giving up on him. During my first month with Simon I had to wear mittens to apply ointment to his fight wound which had turned into an irritated dermatitis. I also had to be very careful walking around him or approaching his space because Simon felt very nervous about humans being too close to him after having been let down by them so horribly and so, he would at times, swat at me if I was getting too close to him. Please do not be discouraged by all that I have shared up to this point because this fostering story has a very happy turn of events. After the first month, Simon started letting me pet him. I could safely place his bowl in front of him without any reaction from him. He began joining me for cuddle sessions in the mornings. Eventually, he started asking for my attention and I knew he missed me when I was gone because he would greet me by the door when I got home. Through the months I've fostered Simon, he has become quite a sweet gentleman and we have not had a single scratch or bite since mid-September! Simon has grown into a loving, loyal, smart and very cuddly companion. He loves to be near his person and so, he always follows me around the house, patiently sits next to me while I do my thing, be it brushing teeth, doing dishes or opening the front door. He talks to me when I first get home to tell me about his day. He even lets me touch his belly! (But not his paws – those are sacred). His favourite thing is whenever I work from home because he can be with me and relax on my bed just behind my work desk as I type away while he’s busy snoozing. As Simon’s curiosity is very moderate, he doesn’t really go into my closets or hidden nooks; Nor does he climb shelves, windowsills or desks. So to date, he has not managed to knock down a single item in our house. He is not big on cat toys although I try engaging him with different kinds but, he is obsessed with his scratchers and will faithfully use them for his claws (but never furniture). What I’m trying to say is that Simon is a wonderful cat. He's smart, loving, patient and as a bonus, he’s very low maintenance. He really doesn’t need much except a human like you to love him and respect him just like he would in return. You will never regret giving this amazing cat a chance, trust me. He amazes me every day. Please note that Simon is FIV+ and he has feline herpes virus. Neither bother him or require special care, except that the herpes virus comes and goes usually in the form of a watery right eye. I was able to manage the watery eye very well by feeding him limited ingredient rabbit/turkey cat food by Instinct which is also needed to keep his dermatitis I mentioned earlier, under good control. He has not had any issues with his dermatitis since being on this diet. He is also taking anti-anxiety medication because otherwise he tends to feel anxious, especially around feeding times and will become restless (running around, meowing and becoming easily over stimulated). As mentioned before, Simon needs to be the only pet in your household as sharing space with other animals stresses him out and a home without children would be best. Ideally, we wish for you to have previous experience living with a cat. Being familiar with cat body language, what it is like having a cat at home (shedding hair, claw marks on your throws, etc.) and having low expectations with an ability to allow Simon to adjust and build trust in his own time is what will ensure a beautiful and rewarding bond is build between you. It is a long shot but all Simon needs is one human to believe in him enough to give him a chance like I did and like Hailey did back in May of 2018. If you are this person, Simon will be super happy to show you just how much love he has to share! Until they are ready to be adopted, we rely on our wonderful volunteer foster parents to take care of them. If you are interested in becoming a foster parent - please fill out the foster parent application today. We are always in need of experienced (or those willing to learn) to join our foster parent family. Abbey Cats is currently in the process of expanding our volunteer team, and we are seeking cat lovers to join! Have a skill set or extra time you can lend to the organization? We want to hear from you! Please fill out our volunteer application today. We also have several leadership positions open - please indicate in your application if this is of interest to you.